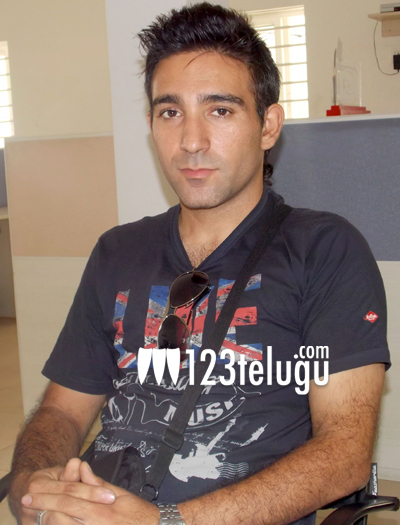 Meet Robak Bobak, who is quite famous in movie production circles as a foreign models co-ordinator for Telugu films. The soft spoken young guy came to Hyderabad in 2009 to complete his M.E. from Osmania University. Hyderabad has a sizeable population of foreign students now and most of them come from South East Asia, Eastern Europe, the Middle East and even South America. Robak Bobak acts as an interface between the Telugu Film Industry and the foreign student community in Hyderabad. Read on to know how he got into the industry, what he thinks about Hyderabad and what he does for a living. He and his team have worked for NTR’s ‘Baadshah’ and they are currently dubbing for the film. Q. Hi Robak. Tell us a bit about yourself. A. Hi. I come from Iran and my name is Robak Bobak. But I call myself Bobby for the locals. I came to Hyderabad in 2009 to study in Osmania University. I completed my graduation in 2011. I work for the International Human Rights Association and also for the film industry. Q. How did you get into this industry ? A. In 2009, I was approached for an Audi commercial program. Someone spotted me there and asked me if I was interested in working for films. I said yes. Initially, I used to appear in Telugu films but these days, I am working as a co-ordinator. I have very good connections in the foreign student community here and people approach me when they need work. They know that I co-ordinate with the industry and the industry people know that I have good connections with the students. That is how it works. Q. What was the first movie you worked for? A. (Thinks) Hmm.. It is hard to tell since I cant pronounce most of the names. I must have worked for about 200 films so far if you include Telugu, Tamil and Hindi films. Many Hindi and Tamil films are being shot in Hyderabad these days. My team worked for Kamal Haasan’s ‘Vishwaroopam’ in Chennai recently. In Bollywood, we worked for ‘Ra.One’, ‘Golmaal 3’, ‘Rockstar’ etc. Q. What work are you doing for ‘Baadshah’? A. My people are currently dubbing for a few scenes from the movie. The movie was shot in Spain and we are providing the foreign voices for the people involved there. We also shot at the GMR facility near Shamshabad, where some of my people participated in a few scenes. Q. Who are your favourite heroes in Telugu? A. Telugu star Nagarjuna is very friendly with me. I like him a lot. I have sent my people for atleast 3 of his films in the last few years. I also like Allu Arjun, NTR and Venkatesh.I like many other people, but I have difficulty pronouncing the names. Q. Do you make good money this way? A. Well, this is not my primary source of income. I have other jobs. I do this more out of friendship and because of my contacts. I take a small percentage from the production unit for co-ordinating with these foreign students. I like working for films. Q. As a foreigner, how do you find Hyderabad? A. Hyderabad is almost like home for me now. I have been here since 2009 and I am used to the city. I get by with English. I have a lot of friends in the foreign student community so I have no problems here. Q. Do you act as a models co-ordinator for other film industries as well? A. Apart from Telugu, I also work with Tamil and Bollywood production houses. Most of our work will be in Hyderabad but if needed, we travel to other cities as well. Like I said, we worked in Chennai for Kamal Haasan’s ‘Vishwaroopam’. Q. What other projects have you and your team signed up for? Bobak speaks with a heavy accent and he comes across as a nice guy. We had fun speaking to him and it was quite interesting to learn about how these foreigners fit into the Telugu Film Industry. So the next time you see a foreign face in a Telugu film, remember Robak Bobak. We hope you enjoyed reading about it too.